One possible way of viewing recessions is that they are essentially a form of a random walk. We can imagine that the economy can transition to a "low growth" state, and then it is easier for random fluctuations to result in a recession. This is often referred to as the economy being near its "stall speed." (An aircraft that drops below its stall speed cannot generate enough lift from its wing surfaces to overcome gravity.) This is a plausible way of looking at empirical recession models, but it dodges the theoretical question as to why the fluctuations happen. Now, consider an economy that grows over time but where growth occurs unevenly (i.e., the economy alternates between high- and low-growth regimes). Imagine, as well, that the economy is occasionally buffeted by negative "shocks"—adverse events that occur at unpredictable moments (an oil price spike, a stock market collapse, etc.). In such an economy, recession is more likely to occur when a negative shock of a given size occurs in a low-growth state as opposed to a high-growth state. Next, suppose that an inverted yield curve forecasts a deceleration in growth. Then the deceleration will entail moving from a higher-growth state to a lower-growth state. Suppose this lower-growth state is near zero. In this state, growth is now more likely to turn negative in the event of a shock. In this way, an inverted yield curve does not forecast recession; instead, it forecasts the economic conditions that make recession more likely. Such a view of growth is related to the concept of Markov switching models, which are described in this article. As noted in that article, the "low growth regime" that was diagnosed by the econometric methods in Hamilton's original work was associated with negative growth. That is, if we attempted to identify a high growth/low growth regime using statistical tests, we are only going to pick out the recessions. We might need a Markov model with three states -- high growth, low growth, and recession. We will put that technical issue aside, and examine a simulation of such a two-speed growth model. The figure above was generated by a Python script, which is available at https://github.com/brianr747/SimplePricers/blob/master/examples/recession_random_walk.py. We can see that there was a transition to a low-growth state at about 1.5 years into the simulation, which lasted for about a year. Although (smoothed) growth did drop to around 1%, it stayed above zero. This is an example of an economy dropping to "stall speed," yet avoiding recession. The author made very little attempts to calibrate parameters, and the underlying model is probably too simple to capture the typical statistical properties of recessions. Instead, the objective was to give a model that generates a reasonable-looking plot, and based on mathematics that is easily understood. What is interesting about models similar to this one is how they fit in with economic theory. From an empirical perspective, it seems entirely plausible that we could align such a regime-change model with various indicators (as per the discussion by Andolfatto and Spewak). If we are lucky, we might be able to get a match between predicted recession probabilities and actual outcomes. One might hope that the recession probability forecasts would be as successful as modern weather forecasters are with their rain probability forecasts. Although I am not convinced that such a model exists, it is not the sort of model I envisage when I argue that economic models have inherent difficulties in forecasting recessions. The difference is that the hypothetical forecasting model is a purely empirical construct, and cannot answer why outcomes are happening. Recessions just happen; a roll of the dice. Even if we identify a low-growth state, we do not know why the economy is in a low-growth state. Furthermore, the model is vulnerable to changing circumstances. Unlike rain, governments can do something about recession forecasts: loosen fiscal policy, or relax monetary policy (the details of which is a point of dispute between Modern Monetary Theory and conventional economics). Furthermore, a "random shock" explanation suggests that there should be no other empirical regularities about recessions (other than a higher probability of transitioning to a low-growth regime ahead of recession). This ignores such factors as debt buildups, coincidence with financial crises, etc. Of course, some recessions may entirely best viewed as a "random shocks," for example a country depending on agriculture could be plunged into a recession by a poor harvest. Even so, we understand the mechanism about the recession, the randomness is just uncertainty about outcomes normally considered to be outside of economics (e.g., crop yields). In summary, although the suggestion that recessions are random and thus hard to forecast seems similar to my views, it is not equivalent. Instead, my argument is that the mechanisms for a recession are relatively well understood, rather the timing is hard to pin down. This follows from the reality that market outcomes (particularly credit markets) drive recessions, and markets are notoriously hard to time. The source code is available at https://github.com/brianr747/SimplePricers/blob/master/examples/recession_random_walk.py. The program prompts the user to enter a numeric seed for the random number generator; the chart above was generated by using 0 (zero). The plot requires the installation of the matplotlib library, which can be difficult to install. The state variable trajectory is calculated by generating a random floating point number between 0 and 1. If the state is in the high growth mode in the previous period, there is a 98% chance of staying in the same mode, while the probability of staying in the low growth is 96%. (I.e., 2% chance of transitioning to low growth from high, and a 4% chance of going from low to high.) The growth state is independent of the actual growth rate. Once the state trajectory is calculated, the monthly growth rate is determined. In the high growth state, the trend growth is 2.5%, while the low growth trend is 0.75%. 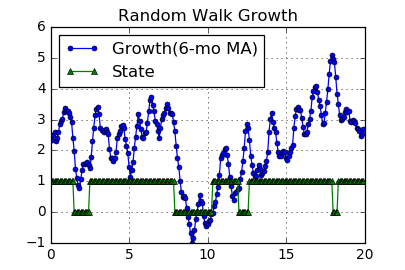 The value of growth is equal to the previous value plus a correction of 25% towards the trend, plus a random variable ("noise"). The noise is normally distributed, with a mean of zero, and a standard deviation of 0.8. Since the monthly growth rate is quite noisy, the six-month moving average is calculated. For the first six periods, the moving average is the mean of the available data.